A little disappointing… but better than nothing! 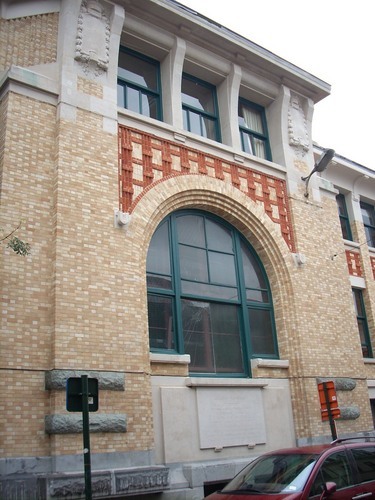 The birthplace of Andreas Vesalius, the Father of Anatomy and consequently of modern Medicine, is remembered only by a marble tablet on the facade of a modern school in Brussels (Rue des Minimes, 71). The latin iscription reads as follows: "DIGNUM MEMORIA - / IN HAC AREA SECULO XVI° / SURGEBAT DOMUS / PERCELEBRIS AUCTORIS / ANDREAE VESALII BRUXELLENSIS / 1515 - 1564 / QUI ANNO 1542 SUUM CELEBERRIMUM / LIBRUM DE HUMANI CORPORIS FABRICA / FELICITER POSTERIS TYPIS MANDAVIT". I believe that Vesalius was born around the corner (rue Joseph Dupont), in 1514 rather than in 1515 as the plaque states. 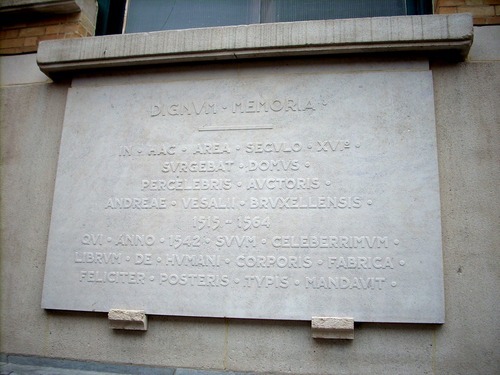 This plaque is at or near where Vesalius built a house (on a street then called Blaerstraat/rue des Feuilles) when he was about 35 years old, having left the retinue of Charles V to come back to Brussels and a lucrative medical practice. According to Richard Van Hee (Ziek of gezond ten tijde van Keizer Karel: Vesalius en de gezondheigszorg in de 16de eew, 2000), the "Huys van Vesalius" was torn down in 1621. Thank you for these useful clarifications!